Inspired by DJ Emidio Vaz from his own popularized independent radio show Emidio's Rock Den, comes volume 2 in a series of hard rock and metal acts, featured upon a compilation release on the Bongo Boy Music Group/Bongo Boy Records companies. 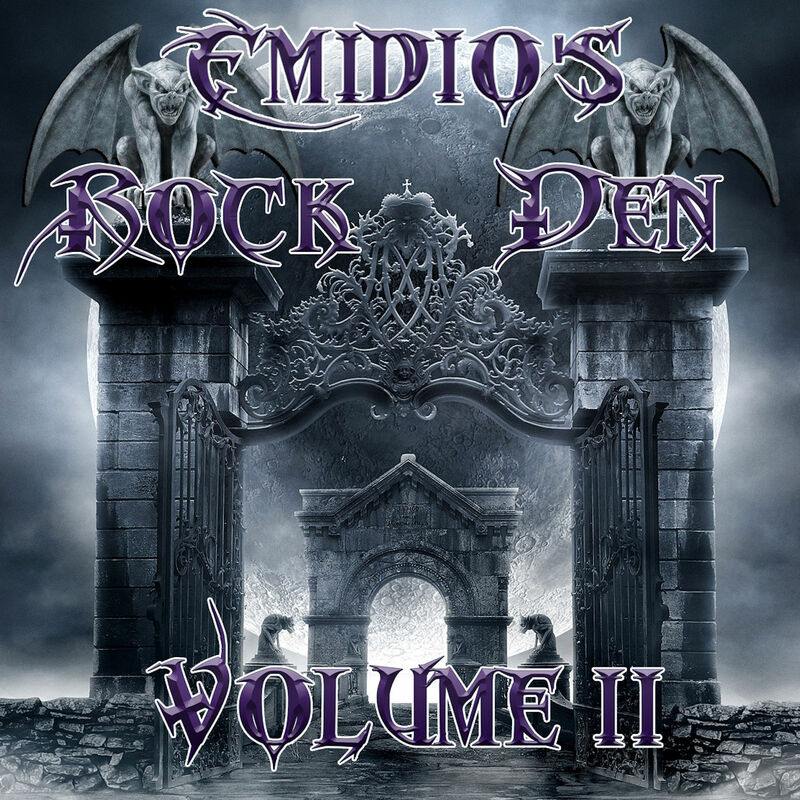 This being titled "Emidio's Rock Den, Vol. 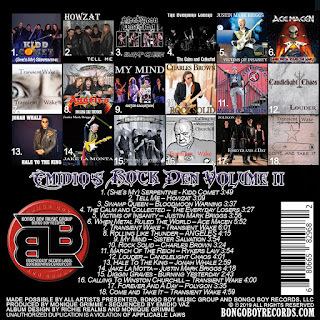 2", contains 18-tracks of various artists, taking on such bands like Kidd Comet with their track "(She's My) Serpentine", along with others like "Tell Me", by Howzat, with many more "Victims of Insanity" by Justin Mark Briggs, "When Metal Ruled the World", by Ace Macen. So many other bands and their tracks come off this release, there’s quite the offering right here alone. With that said though, these acts already selected and the tracks accompanying them are already quite the pickings as they are. Delivering such angst and rebellion is one thing, but the quality of the tracks, make that hard rocking heavy metal vibe stand out far and wide. 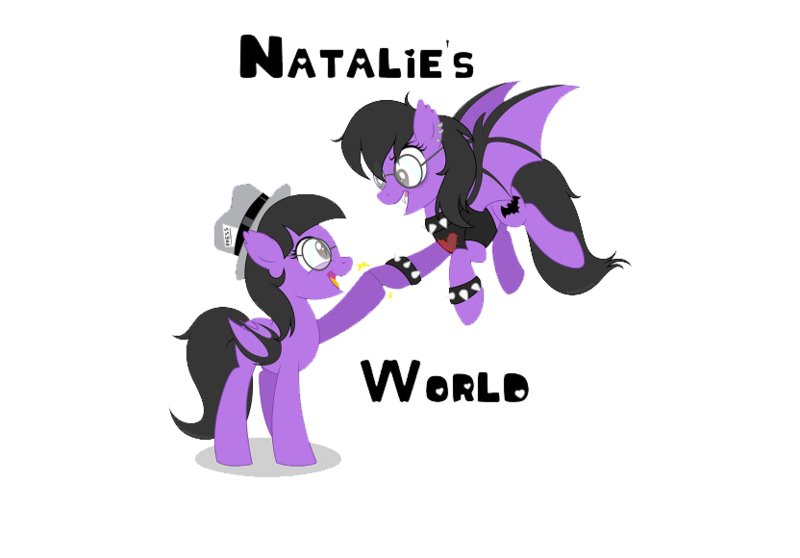 It brings out that classic era of the 80’s meets the 90’s with the bands like White Snake, Kiss, some Metallica, AC/DC you get a very mix match of styles going on with these tracks here. The many others off the 18 total available, are a lot like these, being that mix match of tunes with a lot of style. You will not be bored by hearing these not at all. They deliver complexity and energy unlike any other. When listening to the entirety of this album, you are hit with a rush of fuel, adrenaline, and fun. DJ go getter Emidio, picked some good acts for this compilation release, it will be a hard time finding even greater if not as great of acts, to go onto the next volume in this on going series. When it comes down to it, all that is offered here, is pretty much a good variety and offering for this combination of styling and musical choices. Yeah it takes on the hard rock and heavy metal genres that many hear nowadays or then, but that’s what makes this release one to be heard multiple times over.